Give A Day Get A Disney Day. 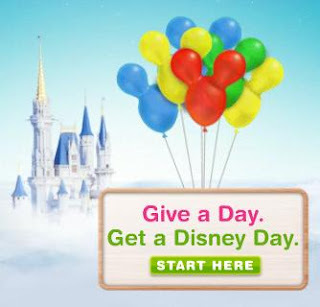 The Disney Park's 2010 Promotion "Give A Day. Get A Disney Day" has been wildly successful. In only 10 weeks since the January 1st, 2010 launch of the program they have reached their goal of having 1 million people to sign up and volunteer. In this tough economy, people have responded with their time by being willing to volunteer in exchange for a one day ticket to a Disney theme park. If you have procrastinated, you have missed your chance. The registration for this promotion has now been closed since they have reached their goal. Congratulations Disney For A Great Idea! This was a landmark concept for a marketing campaign. Not only did Disney generate interest for their theme parks (Disney World and Disneyland) they got their customers to do something to benefit their own communities in the process. Great Job Disney! - "Give A Day. Get A Disney Day" was a great idea, that will hopefully inspire people to continue to volunteer long after they have used their one day park ticket at Disney World. 0 comments to ""Give A Day. Get A Disney Day." Reaches 1 Million Volunteers In 10 Weeks"